A mail order and retail supplier of yarns, fibers, books, and equipment for weaving, spinning, knitting, crocheting, felting, rugmaking, and other fiber arts. Processors of wool and mohair offers hand painted yarn and roving, looms, spinning wheels, and Victorian jewelry. Supplies boards (looms) for making double-knit fabric that adjust to several gauges. Also patterns, books, videos, kits and yarn. Catalogue for spinning and weaving with a guide for products. Includes spinning wheels, looms, knitting supplies, and yarn. Offers looms, spinning wheels and supplies, natural fiber yarns, knitting patterns and tools. Features handspun wool, yarn, roving, looms, Jacob and Tunis sheep, and gift items. Offers wheels and looms, carding and other equipment, wool yarn, combed wool fiber, dyes and books. Sheep farm carrying Schact Spindle Co. looms, fleeces, roving, yarn, supplies, and equipment. Canadian yarn distributor. Site offers descriptions of yarns, list of retail outlets and links to yarn and craft related sites. Natural wool yarn from Cormo sheep, alpaca, angora, and cashmere fiber. Offering yarn, roving, fleeces, stock, and cards. Handmade looms for hand weaving, made from maple and other hardwoods. Handmade looms for hand weaving, made from maple and other hardwoods. Four or eight shafts in several widths. Features wool, fibers, looms, equipment, triangle shawl looms, spindles, and instruction. Folding table and travel looms in 8, 12 and 16 harnesses. Also weaving tools and accessories including 'angel wings'. Makers of small looms including frame, pocket and inkle, as well as knitting spools and weaving accessories. Offers table and transportable looms, tapestry looms and weaving benches. Also kumihimo supplies and books. Rigid heddle and inkle looms, weaving frames, warping boards and specialty looms for children. Also easels, wooden blocks, childrens art supplies and accessories. Offers inkle, rigid heddle, table and floor looms. Also computer-dobby conversion kits for both Macintosh and Windows, accessories and related technical information. Both new and used Dobby, compu-dobby and jacquard looms for the hobby and professional weaver. Also offers software and accessories. Handmade floor looms, beadwork and tapestry looms. Also spinning wheels and weaving accessories. Offers tapestry looms and supplies. Includes tapestry yarns, rug warp, beaters and bobbins. Offers a large selection of yarn, tools, books and patterns. Offers a line of hand knitting yarn and supplies, free patterns and links. Yarn catalog, patterns, and accessories. A yarn store offers service and an inventory of over 8,000 types of yarn as well as needles, accessories and patterns. Yarn manufacturer with yarns, kits, patterns and needles. Also, yarn spinning and carding services. Yarn, knitting, crochet, patterns, and needlework supplies. Full online shopping, terms and information about stores is provided. Source for yarn, knitting, tatting, crochet, patterns, and needlework supplies. Also has many free patterns. Mohair yarn from angora goats. Includes photos of the goats, prices and photos of the yarn and knitting kits and contact information. If the business hours of Halcyon Yarn in may vary on holidays like Valentine’s Day, Washington’s Birthday, St. Patrick’s Day, Easter, Easter eve and Mother’s day. We display standard opening hours and price ranges in our profile site. We recommend to check out halcyonyarn.com/ for further information. 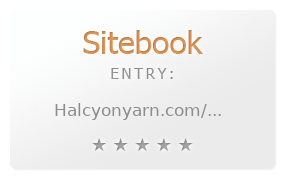 You can also search for Alternatives for halcyonyarn.com/ on our Review Site Sitebook.org All trademarks are the property of their respective owners. If we should delete this entry, please send us a short E-Mail.